First, remodel the façade of the remaining center field complex - as if to make it look like it was built that way. We now have a view of a new complex built outside the stadium, complete with a "village" or "downtown" atmosphere. The streets beyond the stadium (the intersection of Ballpark Way and Randol Mill) can either be closed for each game - or even completely redirected around the new complexes (see map on right). If they are redirected, use the space to practically extend the reach of The Ballpark. In other words, move entrances to The Ballpark next to the new complexes, encouraging fans to visit the retail stores and restaurants before and after (or during) the game. This allows foot-traffic to flow in and out of the stadium more freely. I imagine it could even be possible to turn the streets into a mini "river walk;" which could be supplied from the neighboring lakes. 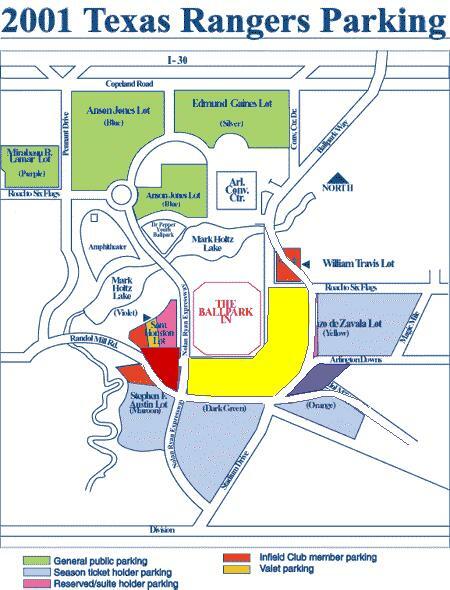 I altered the Rangers' 2001 parking map to show an idea of what Randol Mill and Ballpark Way could look like if they were re-routed around the project. This is quite an overhaul, but it would allow a "village" atmosphere between the project and Ballpark. This also allows the possibility of a "riverwalk." From the creek near the west side of the lake, it could span across the old Randol Mill, next to The Ballpark. It can then head north along the old Ballpark Way and connect the east side of the lake. And since the land between The Ballpark and Mark Holtz Lake is sloped, the stretch heading north could be made into a waterfall.